The Liberator Wireless continues to be one of the most cutting edge products for police motorcycle officers and allows freedom of mobility by eliminating the cable between the officer and the motorcycle providing clear and reliable communication. Since its introduction, the wired SuperMic has rapidly become one of Setcom's most popular products. 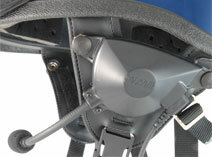 Setcom uses the highest quality speakers and microphones available to make its Helmet Kits. Kits are available for all helmet types: half shell, three-quarter shell and full face. Setcom's cable kits allow an officer to safely key the radio and/or transmit over the public address system without taking his hands off the handlebars. Most states require that motorcyclists have both hands on the handlebars at all times. Advanced electronic design makes Setcom's mobile radio interface systems straight forward to install and durable over the long run.